England’s final group game yesterday was, very unusually, low on headlines and almost totally devoid of the usual hype. A forgettable, if somewhat predictable, 0-0 dead rubber draw with Costa Rica was not even the main football talking point at the moment the game finished, as the antics of a certain Mr Suarez dominated ITV’s post-match debate. Throw in the evening drama of Greece beating the Ivory Coast with a last-gasp penalty to go through and Colombia’s glittering performance against Japan and it has to be said England were very much last on the global footballing agenda. Even their arrival back in the UK today after failing in Brazil has not received the usual publicity given to the team coming home. This was the first time England have ever played a group game when already out of the tournament, but it wasn’t the only occasion when they failed to hog the British headlines on a day they played in the World Cup. For proof of that we can look back exactly 32 years to June 25th, 1982. A day when there were three matches all ending in 1-0 scorelines – a famous shock win for a British side; one of the most controversial matches in World Cup history; and by far the least memorable, England winning a dead rubber. The 1982 World Cup was a strange experience for England. They had made extremely heavy weather of qualifying for their first finals since 1970 and then their presence in the finals was thrown into doubt as the Falklands War broke out. They played in the first 24-team finals and – despite missing the last two World Cups – England were seeded in the draw (a controversial move at the time). They made an incredible start by scoring through Bryan Robson in under 30 seconds of their opening match against a highly-rated French side. But England’s 3-1 win was to be the highlight of their finals, as the goals dried up and Kevin Keegan and Trevor Brooking desperately fought to be fit to be even bit-part players in the World Cup (they had never played in the finals and would never get another chance). Throw in an odd second round format of four groups of three teams with just one progressing and England going out without losing, and it was a very different World Cup to normal for the English fan. And sadly, not perhaps the most memorable either. Ron Greenwood’s men qualified from their first round group with a routine 2-0 win over Czechoslovakia in their second group game. Their third game against Kuwait would be played on Friday, June 25th in Bilbao. England had already won the group and Kuwait were out unless they could win by a cricket score, effectively making it meaningless. England didn’t change things too much (the decision to keep Peter Shilton in goal virtually ended any hope Ray Clemence had of playing a World Cup match) but Steve Foster, Phil Neal and Glenn Hoddle were brought into the starting line-up. It proved a fairly forgettable contest in the afternoon sunshine, settled in England’s favour thanks to a Trevor Francis first half goal as they enjoyed a rare 100% group record. Highlights of England’s 1-0 win over Kuwait. Well done anyone who can recall anything other than the goal from this game. The real drama, or total lack of it, was taking place at the same time as England’s match. In another oddity of the World Cup, West Germany’s three group matches were all played at the same time as England’s despite the teams being in different groups (it was common until Italia ’90 for group games that had no bearing on each other to be played at the same time). This made it more strange that FIFA still did not consider it appropriate for the final round of games in each game to be played simultaneously to limit the threat of possible collusion, particularly after the controversy of Argentina’s decisive 6-0 win over Peru in 1978 being played in isolation. 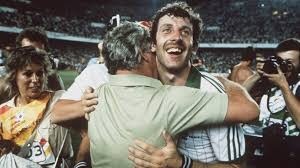 West Germany had famously lost 2-1 to Algeria in their opening match in Spain, with subsequent results meaning it would come down to the final game in the group against neighbours Austria in Gijon. Algeria had won 3-2 against Chile the previous day and they would go through if the Germans failed to win or if Austria were beaten by three goals or more. The passage of time means some British fans seem to recall sitting through the 90 minutes of West Germany against Austria and being disgusted at what they saw. The reality is no one, apart from presumably the odd person in a TV studio, would have watched it in full unless they were abroad at the time. ITV was probably one of the few channels in the world to screen England’s meaningless match live and the BBC did not show an afternoon match. But viewers would soon discover just what had taken place. As is well known, the West Germans scored early and the game quickly fizzled out to a lifeless 1-0 result that suited both sides as suspicions grew around the world. Algeria were left particularly disgusted, but so too were many others. Anschluss was one memorable headline used to describe the events. Perhaps the most disappointing element was that Austria seemed to abandon any attempt to repeat their great victory over West Germany at the previous World Cup finals, which they had widely celebrated despite already being out of the tournament. BBC viewers tuning in for the live Spain against Northern Ireland match that evening were to see the controversy already developing. “It has to be said the match had all the makings of a carve-up and that’s the way it turned out,” said a clearly unimpressed David Coleman when introducing brief footage of the match, which incidentally meant West Germany would be in the same second phase group as England (whose own highlights on the BBC were extremely brief, summing up the meaningless nature of their match). FIFA would rightly change the format from 1986 to as we know it today with the final matches in each group played simultaneously, but that was four years too late for Algeria. Some faith quickly needed to be restored in the tournament and for British viewers that would come in the evening match. On a momentous night, Northern Ireland famously won 1-0 against hosts Spain thanks to a Gerry Armstrong goal. Billy Bingham’s side courageously held out despite being reduced to 10 men when Mal Donaghy was controversially sent off. Another goal for the Irish would have put Spain out, but there was no suggestion of any underhand arrangement here as Bingham’s men gave one of the most gutsy performances by a UK side at any World Cup. Spain had been poor in the group stage and things would not improve in the second round as they took just one point from their matches against West Germany and England, the latter falling at the same hurdle after two 0-0 draws. By then how England did was back as the main concern for the British sporting media. But for one game in this World Cup they had been last on the agenda, a day when UK pride was reserved for Northern Ireland defying the odds and when all the controversy was in the one match containing no direct British interest. We’ve had to wait a long time for an England World Cup match to be so insignificant again. And it somehow doesn’t feel right when it happens, does it?